Earn $1.60 in VIP credit (160 points)What's This? 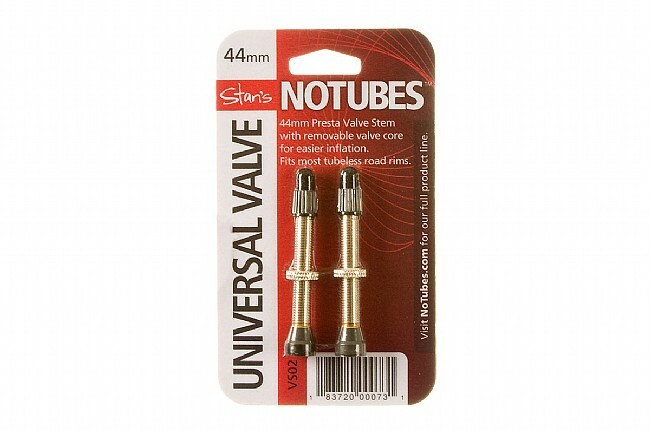 Stans NoTubes has updated their tubeless valve design for even better performance. The new Road Valve Stem is required for tubeless conversion using the old taping method on non-tubeless rims, or can be used as replacement valve for many tubeless rims. It's 44mm long to accommodate most road rim depths, and features a removable valve core for easier tire sealant application and hassle-free extender installation. Fits up to an 8mm valve hole. Sold in pairs. Used with Stans rims. No issues. Would buy again. I tried cheaper stems and had them pull through the rims. I went back to the original, best tubeless stem. Removable core, seals, what more can you ask for? art deco? Over time the rubber seals at the end of the valve and the rubber seals on the valve cores get torn or become brittle and you need to replace them. Might as well go with the original, Stans. These work great and are a resonable price. In my experience they work on all rims. Why din't I do this sooner? Combined with Stan's fill kit/injector they're fantastic. Tire on, exactly the amount of sealer I want, not a drop on the floor. Removable core makes a difference! Bought these valve stems because my Dura-ace C24's stems did not have removable cores which makes all the difference when applying sealant into the mounted tire that is beaded into the wheel. Stans valve stem was the perfect length and shaped the way it should be to fix into pista air chucks. Thanks, now it's simple to add air or sealant to my Shimano tubeless wheel set. Longer than the OEM stems that came with my Campy 2 Way wheelset and easier to use. Seem to seal up better than the rubber block that comes on most of the other tubeless stems.